The Vixens go on a recon mission to get some intel on the Southside Serpents as the gang prepares for a showdown to save Riverdale. 'Betty and Veronica: Vixens' may be the guiltiest of pleasures. 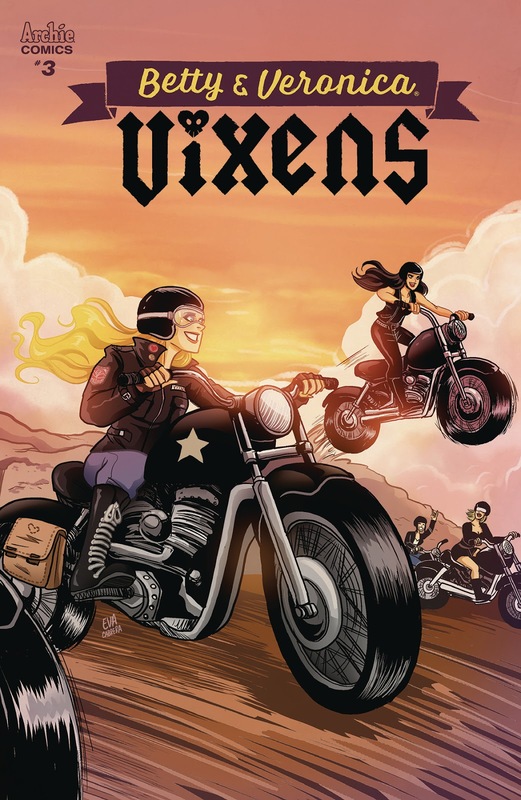 Seeing Betty, Veronica, Toni Topaz, Midge, Ethel, and Evelyn in the Archie version of 'Sons of Anarchy' essentially is something I never knew I needed or that I would ever see. The fact that I'm wholly invested in seeing them turn into badass biker chicks to lay waste to the Southside Serpents probably says a lot about me but that's why this alt-world story is such a blast. The issue opens up as the others have with the Vixens on a mission. They try to quietly infiltrate a bar to gather some information among the "anti-PC" bikers but things deteriorate quickly. They way they jump into action as a gang is quite impressive, it's no Outsiders but exciting still. And as usual, the story jumps back in time to explain how they got here. Balancing being good students, cheerleaders and gang leaders have been a struggle for Betty and Veronica as some of the girls are anxious to start making a difference and/or fighting Serpents. Mr. Weatherbee seems a bit concerned about who the girls are hanging around with,. Evelyn has gone missing, and Ambrose is still recovering from his injuring when the Serpents stole his stuff and roughed him up. It's time to do something and help people. The montage of the girls seeking justice for mostly petty stuff serves as the perfect trial run for their type of good-natured "mayhem" as the Vixens. But things get serious once they come face-to-face with the Serpents themselves. The gauntlet is thrown leading to what should be a killer next issue. Eva Cabrera and Elaina Unger continue to do really fun colorful designs that mix classic Archie style with 50's greaser-influenced wardrobe and accessories. Cabrera's layouts are fast-paced and energetic that help make the Vixens actually look like a force to be reckoned with.Unger's colors are so rich, vibrant and plentiful that scenes pop more because of it. 'Betty and Veronica: Vixens' keeps shattering what you may think of Riverdale's female characters. There's a fierce sense of justice and toughness that was lying underneath them all along and Cabrera and Jamie Rotante has brought their inner-biker girl to the surface. This issue mixes set-up and action in a way that will grab you and have you demanding more.